On 7 June 1880, Sultan Abdul Hamid II presented Kaiser Wilhelm II with a property on the western shores of the Bosporus in Istanbul’s Tarabya district for use as a summer residence of the German ambassador to the Ottoman Empire. As the title deed requires Germany to use the property for diplomatic purposes, the property today falls under the authority of the German Embassy in Ankara. 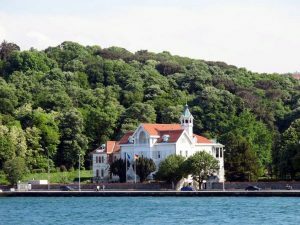 It was the inviolability of the premises at Tarabya that led German-Turkish journalist Deniz Yücel to ask the German authorities on 25 December 2016 for refuge there. Yücel, Turkey correspondent for the German daily Die Welt since May 2015, had reported, inter alia, on links between the Turkish Minister of Energy and Natural Resources and son-in-law of President Recep Tayyip Erdogan, Berat Albayrak, and a company implicated in secret oil deals with the Kurds in northern Iraq. The report was based on the private emails of Mr. Albayrak which had been obtained illegally by a Turkish computer hacker group, RedHack, which is considered a terrorist organization in Turkey. On 4 December 2016, the Istanbul Chief Public Prosecutor’s Office launched an investigation into links between nine journalists, including Deniz Yücel, and RedHack. In the morning hours of 25 December 2016, six of the nine journalists were arrested, which led Deniz Yücel to ask for refuge on the embassy premises in Tarabya. In the following weeks, while he was wanted by police for questioning, it was stated by friends and family that he was “abroad”. On 14 February 2017, after being holed up inside the German embassy premises for 51 days, Deniz Yücel turned himself in at Istanbul police headquarters and was taken into custody. On 27 February 2017, an Istanbul court ordered his detention pending trial for “propaganda in support of a terrorist organisation” and “inciting the public to violence”. “This person hid in the German embassy as a member of the PKK and a German agent for one month. When we told them to hand him over to be tried, they refused. The longer Deniz Yücel stayed on the embassy premises at Tarabya, the more untenable the situation became for the Federal Government. If Germany was to avoid the fate of Ecuador which, at the time, had been hosting Wikileaks founder Julian Assange in its London embassy for more six years, Deniz Yücel had to be convinced to leave voluntarily. “The right of diplomatic asylum which initially existed in Latin America as regional customary international law was codified by the Latin American states in the Havana Convention of 1928 and was further developed in two conventions in Montevideo 1933 and Caracas 1954. By virtue of these conventions, only the diplomatic missions of the Latin American States parties to these conventions have the right to grant diplomatic asylum. For other states and their missions – including the Embassy of the Federal Republic of Germany – this right does not exist. Against the background of its position on diplomatic asylum, the Federal Government would have had to turn over Deniz Yücel to Turkey if the Turkish authorities had made a formal request for his transfer, even if it had considered the criminal investigation or the prosecution against him politically motivated. By leaving voluntarily, Yücel thus saved the Federal Government from huge public embarrassment. This may have been one reason why the Federal Government worked so strenuously for his release.